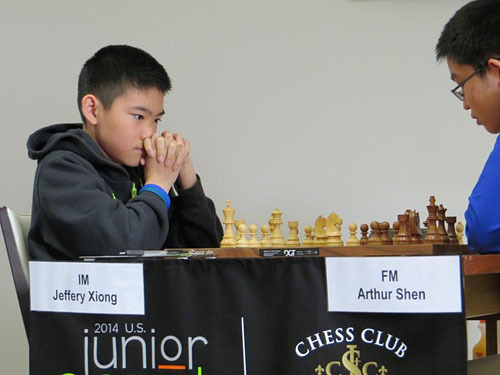 The plot thickens as Jeffery Xiong has bolted into the lead with another win. Ironically only the lowest-rated player has held him. His victim this round was Arthur Shen and allowed him to pass Kayden Troff who was held by Aleksandr Ostrovskiy. Both of these games were Rossolimo Sicilians. Ostrovskiy-Troff was a rather placid draw, but in Xiong’s case he built up a spatial advantage after Shen made some inaccuracies. IM Jeffery Xiong takes the lead after crushing win. wow the parity! Round 5 Bodek takes out Troff, Sevian takes out Xiong, Larsen takes out Ostrovskiy!, Shen takes out Colas, and the only draw is Williams V Harmon-Vellotti.